and love to use up my scraps. 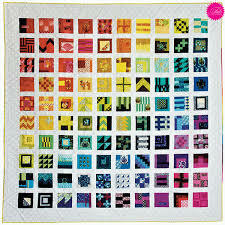 Especially to make scrappy / rainbow quilts. but nothing has really caught my eye / inspired me. and I have promised myself that I will not over think any of the blocks. There are 100 blocks and I am hoping that I can commit to one block a day. So far so good, here are my first weeks blocks. Some people may remember that I started a Dear Jane Quilt. ready to come out again ......... one day! Enjoy the start to your week. 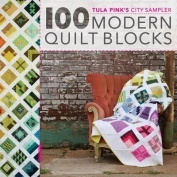 Tula's new book looks so inviting. I love the blocks you have made. Great new book. I love the block so far. Love it , it is so modern. Wow! Lovely blocks - Dear Jane, hmm! I wonder where my quilt blocks are? I have done dozens, I think. Must go looking for her next weekend. Fabulous project. This one looks to be definitely a "you' project. What a fantastic idea. I love what you have done so far. I've just bought my Dear Jane pattern/book and so far I'm motivated........... however, I can see that it will end up being a very lonnnnng project. Look forward to seeing your work. Great choice for your scraps. You must have the best scrap stash. You do have some beautiful blocks there Sharon. I totally understand about Dear Jane as mine has always been thought of as a very long term project too. I have looked at that book so many times...will I love it or won't I? Do I have enough projects to keep my busy? I am sitting avoiding reports looking at your blog wishing we could trade places...your sewing is just beautiful. What an awesome challenge for yourself Sharon! Love your blocks, they are just gorgeous :) I have found in such challenges that if I allow myself an 'off' day every now and then that it doesn't become a burden on me by the time I am half way done or so. And then on my 'off' day I'm not so disappointed that I didn't get what I thought I should have gotten done ;) Love your blog, it is such an inspiration! Wow - one a day is quite the rigorous schedule! And you accuse me of not sleeping! Ha ha. Love your blocks so far. I will be joining in with you but not just yet! Love the look of your "scrap" box.